According to a report of Transparency Market Research, the global apple sauce market has competitive vendor landscape. Some of the key players operating in the apple sauce market are The J.M. Smucker Company, Nestlé S.A., Dr Pepper Snapple Group, Knouse Foods Cooperative Inc., and Materne North America Corp. In order to gain competitive edge these companies are focusing on product innovation and research and development (R&D) activities in the apple sauce market. Additionally, these players are trying to improve their distribution channel to expand their reach across the globe. 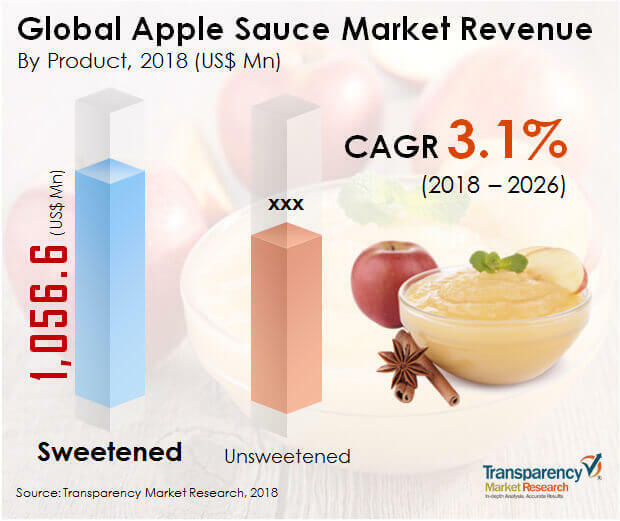 According to TMR, the global apple sauce market was valued at US$1,655.1 mn in 2017 and is projected to expand with a CAGR of 3.1% during the estimated period to reach US$2,169.3 mn by the end of forecast period. Based on the packaging, the cup segment is expected to account for share of 40.9% in 2017 and is expected to remain dominant over the forecast period. Based on the distribution channel, indirect segment is dominating the global market for apple sauces. Of these, retail-based stores accounted for larger share of about 85% in 2017. Based on the region, North America dominated the global market apple sauce followed by Europe. However, Asia Pacific is expected to expand with higher CAGR owing to growing consumer awareness towards the benefits with consumption of apple sauce in developing countries present in the region. Apple is one of the most widely cultivated and consumed fruits. It contains high number of nutrients such as vitamins, antioxidants, and dietary fiber. The growing awareness about the health benefits due to consumption of apple is boosting adoption of apple products such as sauce, juices, and flavored products. This growing demand for apple flavored products is fuelling demand for apple sauces and likely to propel growth of the apple sauce market. Growing inclination toward a healthy lifestyle will boost the consumption of food with high health benefits. Health conscious people are increasingly spending on healthy diet and wellness thanks to the approach for healthy diets. Apple sauce offers the benefits such as weight loss, treatment of diabetes, and improving condition of heart. These aforementioned factors are supporting growth of the apple sauce market. Growing trend of the favored apple sauces such as pulp, sweetened and spiced apple sauces with enhanced tastes due to addition of sugar or cinnamon is boosting its adoption in numerous application mainly in the household applications. Additionally, growing adoption of these sauces from bakeries operating on large scale. This trend is expected to continue over the forecast period and likely to boost growth of the global apple sauce market. In addition, high production rate of apples in the developing countries such as China and India coupled with growing packaged food and beverages industries. Some of the international players are operating in the food and beverages industry are present in the region. Thanks to the health benefits and growing sales of the apple sauces in the region, these players are trying to research on the product for innovation and improvement. These new products are offering lucrative opportunities for growth over the forecast period.